Everybody is looking for KRISHNA. Some don't realize that they are, but they are. KRISHNA is GOD, the Source of all that exists, the Cause of all that is, was, or ever will be. As GOD is unlimited HE has many Names. Allah-Buddha-Jehova-Rama: All are KRISHNA, all are ONE. God is not abstract; He has both the impersonal and the personal aspects to His personality which is SUPREME, ETERNAL, BLISSFUL, and full of KNOWLEDGE. As a single drop of water has the same qualities as an ocean of water, so has our consciousness the qualities of GOD'S consciousness... but through our identification and attachment with material energy (physical body, sense pleasures, material possessions, ego, etc.) our true TRANSCENDENTAL CONSCIOUSNESS has been polluted, and like a dirty mirror it is unable to reflect a pure image. With many lives our association with the TEMPORARY has grown. This impermanent body, a bag of bones and flesh, is mistaken for our true self, and we have accepted this temporary condition to be final. YOGA (a scientific method for GOD (SELF) realization) is the process by which we purify our consciousness, stop further pollution, and arrive at the state of Perfection, full KNOWLEDGE, full BLISS. If there's a God, I want to see Him. It's pointless to believe in something without proof, and Krishna Consciousness and meditation are methods where you can actually obtain GOD perception. You can actually see God, and Hear Him, play with Him. It might sound crazy, but He is actually there, actually with you. In these Western countries, when someone sees the cover of a book like Krishna, he immediately asks, "Who is Krishna? Who is the girl with Krishna?" etc. The immediate answer is that Krishna is the Supreme Personality of Godhead. How is that? Because He conforms in exact detail to descriptions of the Supreme Being, the Godhead. 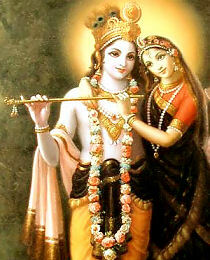 In other words, Krishna is the Godhead because He is all-attractive. Outside the principle of all-attraction, there is no meaning to the word Godhead. How is it one can be all-attractive? First of all, if one is very wealthy, if he has great riches, he becomes attractive to the people in general. Similarly, if someone is very powerful, he also becomes attractive, and if someone is very famous, he also becomes attractive, and if someone is very beautiful or wise or unattached to all kinds of possessions, he also becomes attractive. So from practical experience we can observe that one is attractive due to 1) wealth, 2) power, 3) fame, 4) beauty, 5) wisdom, and 6) renunciation. One who is in possession of all six of these opulences at the same time, who possesses them to an unlimited degree, is understood to be the Supreme Personality of Godhead. These opulences of the Godhead are delineated by Parasara Muni, a great Vedic authority. We have seen many rich persons, many powerful persons, many famous persons, many beautiful persons, many learned and scholarly persons, and persons in the renounced order of life unattached to material possessions. But we have never seen any one person who is unlimitedly and simultaneously wealthy, powerful, famous, beautiful, wise and unattached, like Krishna, in the history of humanity. Krishna, the Supreme Personality of Godhead, is an historical person who appeared on this earth 5,000 years ago. He stayed on this earth for 125 years and played exactly like a human being, but His activities were unparalleled. From the very moment of His appearance to the moment of His disappearance, every one of His activities is unparalleled in the history of the world, and therefore anyone who knows what we mean by Godhead will accept Krishna as the Supreme Personality of Godhead. No one is equal to the Godhead, and no one is greater than Him. That is the import of the familiar saying, "God is great." There are various classes of men in the world who speak of God in different ways, but according to Vedic literatures and according to the great acaryas, the authorized persons versed in the knowledge of God, in all ages, like acaryas Sankara, Ramanuja, Madhva, Visnusvami, Lord Caitanya and all their followers by disciplic succession, all unanimously agree that Krishna is the Supreme Personality of Godhead. As far as we, the followers of Vedic civilization, are concerned, we accept the Vedic history of the whole universe, which consists of different planetary systems called Svargalokas, or the higher planetary system, Martyalokas, or the intermediary planetary system, and Patalalokas, or the lower planetary system. The modern historians of this earth cannot supply historical evidences of events that occurred before 5,000 years ago, and the anthropologists say that 40,000 years ago Homo sapiens had not appeared on this planet because evolution had not reached that point. But the Vedic histories, the Puranas and Mahabharata, relate human histories which extend millions and billions of years into the past. For example, from these literatures we are given the histories of Krishna's appearances and disappearances millions and billions of years ago. In the Fourth Chapter of the Bhagavad-gita Krishna tells Arjuna that both He and Arjuna had had many births before and that He (Krishna) could remember all of them and that Arjuna could not. This illustrates the difference between the knowledge of Krishna and that of Arjuna. Arjuna might have been a very great warrior, a well-cultured member of the Kuru dynasty, but after all, he was an ordinary human being, whereas Krishna, the Supreme Personality of Godhead, is the possessor of unlimited knowledge. Because He possesses unlimited knowledge, Krishna has a memory that is boundless. Krishna's knowledge is so perfect that He remembers all the incidents of His appearances some millions and billions of years in the past, but Arjuna's memory and knowledge are limited by time and space, for he is an ordinary human being. In the Fourth Chapter Krishna states that He can remember instructing the lessons of the Bhagavad-gita some millions of years ago to the sun-god, Vivasvan. Nowadays it is the fashion of the atheistic class of men to try to become God by following some mystic process. Generally the atheists claim to be God by dint of their imagination or their meditational prowess. Krishna is not that kind of God. He does not become God by manufacturing some mystic process of meditation, nor does He become God by undergoing the severe austerities of the mystic yogic exercises. Properly speaking, He never becomes God because He is the Godhead in all circumstances. Within the prison of His maternal uncle Kamsa, where His father and mother were confined, Krishna appeared outside His mother's body as the four-handed Visnu-Narayana. Then He turned Himself into a baby and told His father to carry Him to the house of Nanda Maharaja and his wife Yasoda. When Krishna was just a small baby the gigantic demoness Putana attempted to kill Him, but when He sucked her breast He pulled out her life. That is the difference between the real Godhead and a God manufactured in the mystic factory. Krishna had no chance to practice the mystic yoga process, yet He manifested Himself as the Supreme Personality of Godhead at every step, from infancy to childhood, from childhood to boyhood, and from boyhood to young manhood. In this book Krishna, all of His activities as a human being are described. Although Krishna plays like a human being, He always maintains His identity as the Supreme Personality of Godhead. Since Krishna is all-attractive, one should know that all his desires should be focused on Krishna. In the Bhagavad-gita it is said that the individual person is the proprietor or master of the body but Krishna, who is the Supersoul present in everyone's heart, is the supreme proprietor and supreme master of each and every individual body. As such, if we concentrate our loving propensities upon Krishna only, then immediately universal love, unity and tranquillity will be automatically realized. When one waters the root of a tree, he automatically waters the branches, twigs, leaves and flowers; when one supplies food to the stomach through the mouth, he satisfies all the various parts of the body. The art of focusing one's attention on the Supreme and giving one's love to Him is called Krishna consciousness. We have inaugurated the Krishna consciousness movement so that everyone can satisfy his propensity for loving others simply by directing his love towards Krishna. 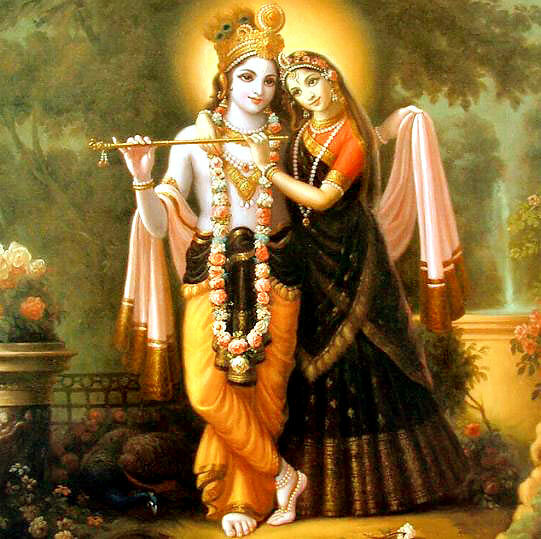 The whole world is very much anxious to satisfy the dormant propensity of love for others, but the inventions of various methods like socialism, communism, altruism, humanitarianism, nationalism, and whatever else may be manufactured for the peace and prosperity of the world, are all useless and frustrating because of our gross ignorance of the art of loving Krishna. Generally people think that by advancing the cause of moral principles and religious rites, they will be happy. Others may think that happiness can be achieved by economic development, and yet others think that simply by sense gratification they will be happy. But the real fact is that people can only be happy by loving Krishna. 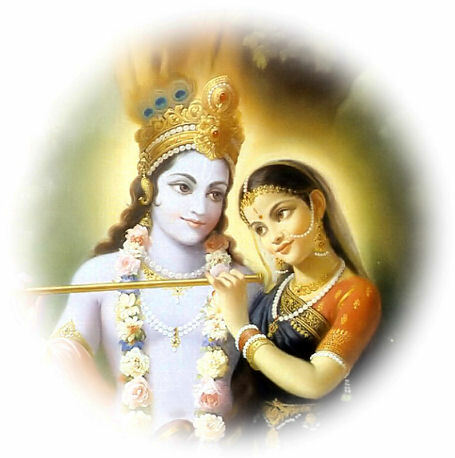 Krishna can perfectly reciprocate one's loving propensities in different relationships called mellows or rasas. 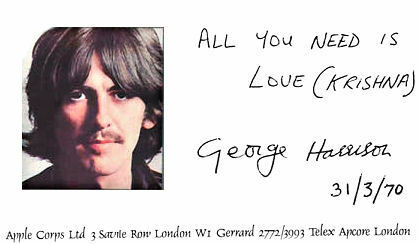 Basically there are twelve loving relationships. One can love Krishna as the supreme unknown, as the supreme master, the supreme friend, the supreme child, the supreme lover. These are the five basic love rasas. One can also love Krishna indirectly in seven different relationships, which are apparently different from the five primary relationships. All in all, however, if one simply reposes his dormant loving propensity in Krishna, then his life becomes successful. This is not a fiction but is a fact that can be realized by practical application. One can directly perceive the effects that love for Krishna has on his life. In the Ninth Chapter of the Bhagavad-gita this science of Krishna consciousness is called the king of all knowledge, the king of all confidential things, and the supreme science of transcendental realization. Yet we can directly experience the results of this science of Krishna consciousness because it is very easy to practice and is very pleasurable. Whatever percentage of Krishna consciousness we can perform will become an eternal asset to our life, for it is imperishable in all circumstances. It has now been actually proved that today's confused and frustrated younger generation in the Western countries can directly perceive the results of channeling the loving propensity toward Krishna alone. It is said that although one executes severe austerities, penances and sacrifices in his life, if he fails to awaken his dormant love for Krishna, then all his penances are to be considered useless. On the other hand, if one has awakened his dormant love for Krishna, then what is the use in executing austerities and penances unnecessarily? The Krishna consciousness movement is the unique gift of Lord Caitanya to the fallen souls of this age. It is a very simple method which has actually been carried out during the last four years in the Western countries, and there is no doubt that this movement can satisfy the dormant loving propensities of humanity. This book Krishna is another presentation to help the Krishna consciousness movement in the Western world. This transcendental literature is published in two parts with profuse illustrations. People love to read various kinds of fiction to spend their time and energy. Now this tendency can be directed to Krishna. The result will be the imperishable satisfaction of the soul, both individually and collectively. It is said in the Bhagavad-gita that even a little effort expended on the path of Krishna consciousness can save one from the greatest danger. Hundreds of thousands of examples can be cited of people who have escaped the greatest dangers of life due to a slight advancement in Krishna consciousness. We therefore request everyone to take advantage of this great transcendental literature. One will find that by reading one page after another, an immense treasure of knowledge in art, science, literature, philosophy and religion will be revealed, and ultimately, by reading this one book, Krishna, love of Godhead will fructify. 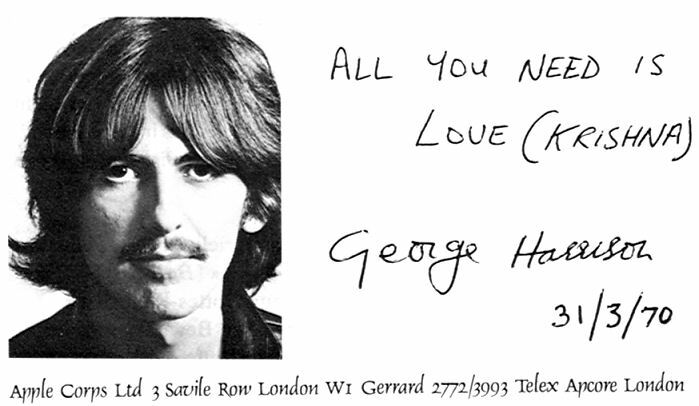 My grateful acknowledgement is due to Sriman George Harrison, now chanting Hare Krishna, for his liberal contribution of $19,000 to meet the entire cost of printing this volume. May Krishna bestow upon this nice boy further advancement in Krishna consciousness.